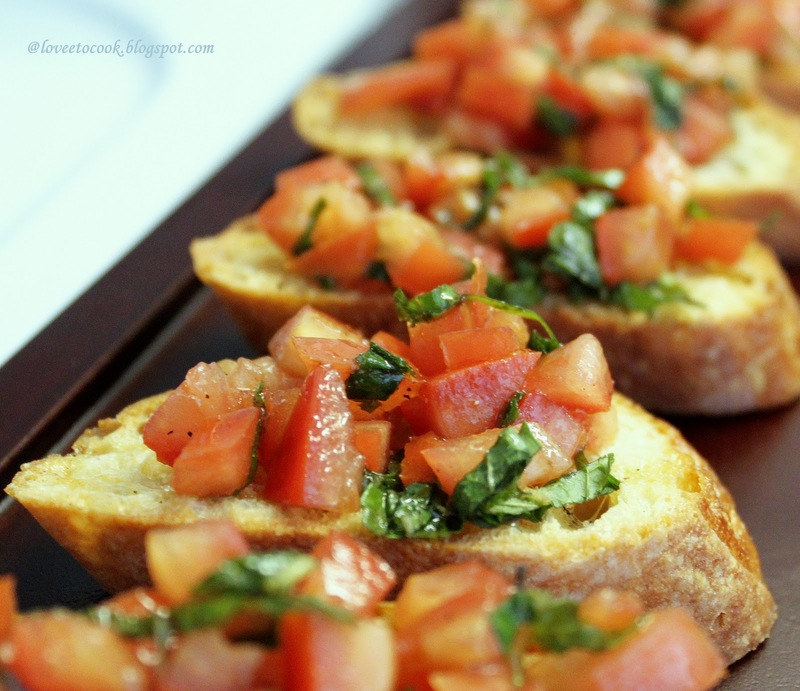 Bruschetta [read as brus-ketta] is a hearty snack from central Italy. Its basically a crusty grilled bread, rubbed with garlic and sprinkled with salt and pepper. Variations include toppings running as wild as your imagination. I present to you the classic vegetarian version topped with fresh tomato, basil and garlic in light balsamic. This international snack has a very wide appeal, I was pleasantly surprised when my mother in law urged me to make these almost every week when she was here visiting us..the tart sweet aged taste really grew on her. The recipe was an super duper hit. 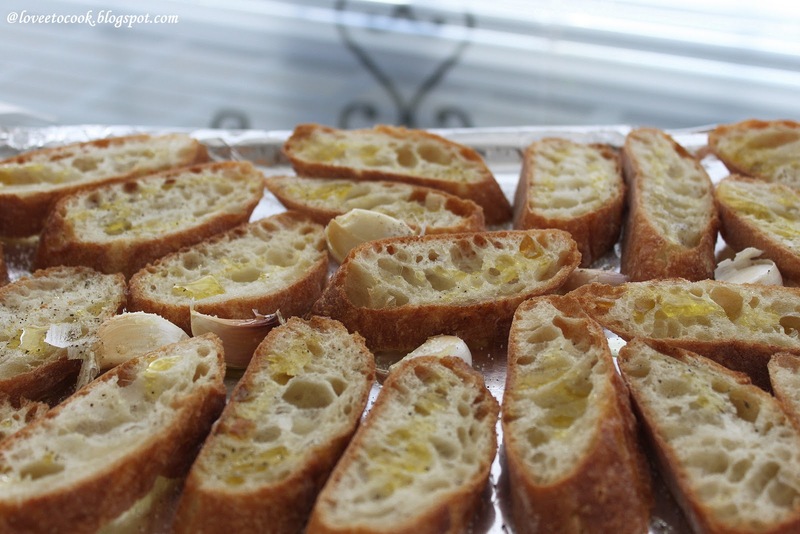 To start, slice the baguette at a slight diagonal with a bread knife and lay the pieces on a sheet pan. Preheat your oven to 350f. 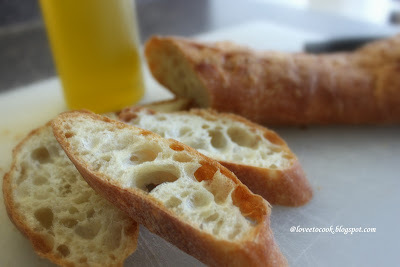 In the meantime, drizzle some olive oil and salt pepper on the sliced baguette. Bake for 10 to15 minutes or till toasted. I chose a baguette, as it's a crusty bread with big air pockets throughout making it super light and toasty when baked. You are also welcomed to substitute any artisan bread of your liking or availability. 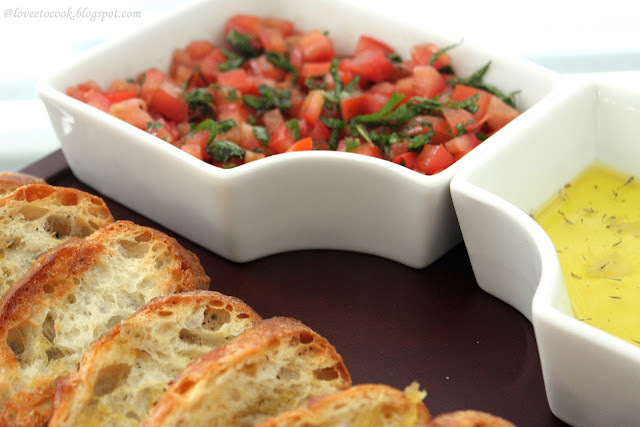 While the bread is getting baked, take the diced tomatoes in the bowl and mix the rest of the ingredients for the topping. Chiffonade some basil or mint and mix. Cover and let the topping chill for 15 minutes. Take the sheet pan out of the oven as the baguettes get toasted and lightly browned. Rub the sliced raw garlic to the toasts while warm. nice...never tried roasting the garlic or adding balsamic vinegar to my recipe...will try your way this time! !